This project used QGIS to examine two DEMs, one derived from LiDAR (inset) and the other from aerial imagery. The difference between models (below) shows that one method has some serious problems. Slope analysis revealed that the source of error was a poorly-generated photo-DEM, with many tiling artifacts. I used QGIS to investigate the quality of maps derived from 3D photogrammetry (AKA mapping-by-matching or structure-from-motion). Here, I use subsets of building survey points as GCPs, and compare the results to a full set of control points. 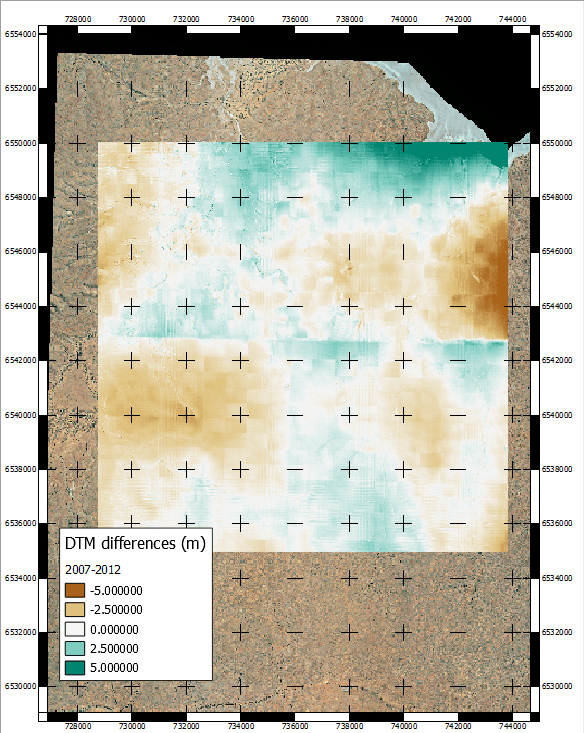 The aim was to see how the method performed with very sparse control, emulating a sea ice survey. Initial results are very promising! 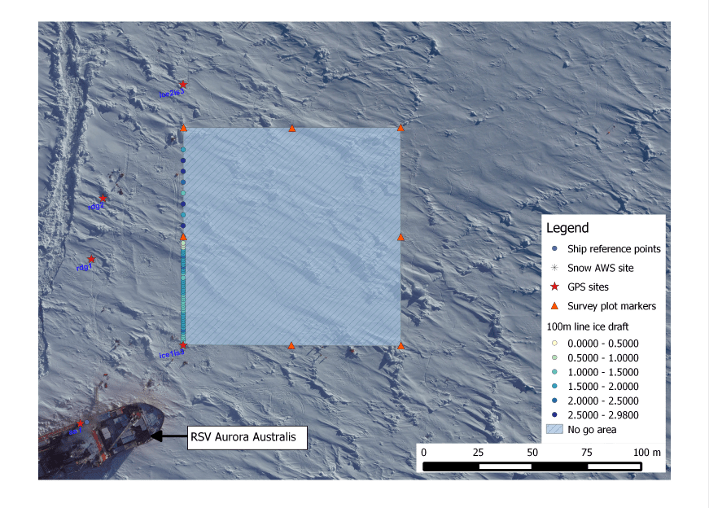 This is a sample map of a 2012 sea ice field site, using a Photoscan-derived orthophoto; total station survey points and a ‘swim track’ of an under-ice AUV. 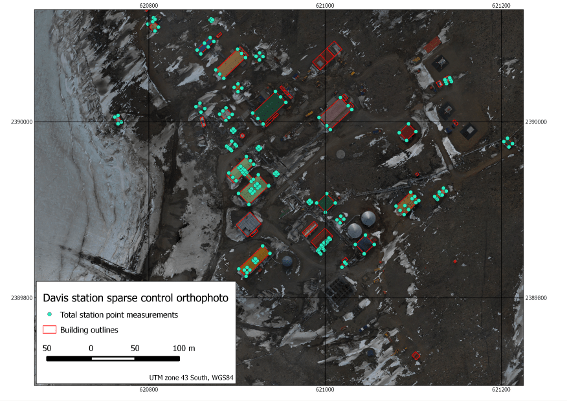 A local coordinate system map of on-ice activities at SIPEX 2 ice station 3. 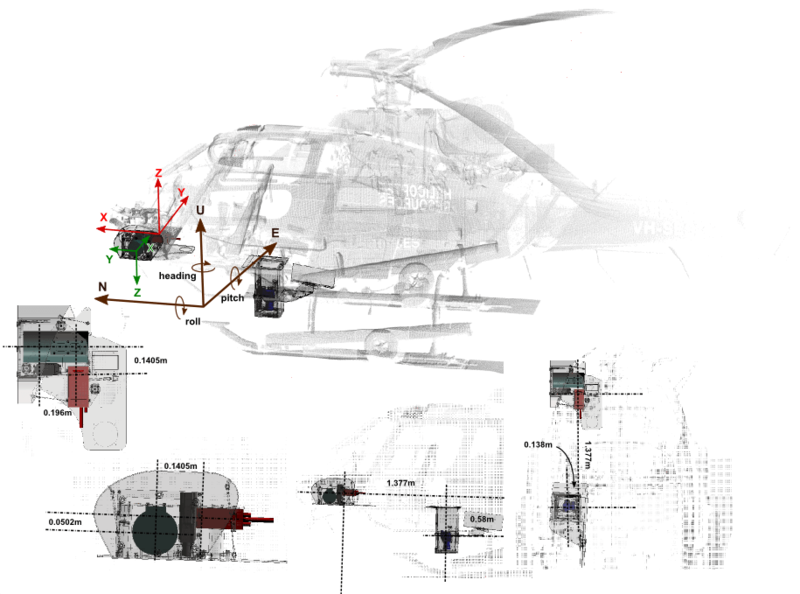 The AAD helicopter-borne LiDAR and photography instrument package is difficult to measure properly. A tape measure does a good job, but doesn’t give any data about angular misalignments – and cannot measure precisely things like position of a camera focal plane. In 2012 I surveyed the aircraft and TLS registration points using a reflectorless total station, meaning I could survey points on instruments and mounts inside the aircraft, as they were installed. A coincident 3D laser scan was collected and registered to total station coordinates (local metres). Using Bentley Microstation, I added Solidworks engineering drawings for the instruments and mounts and carefully aligned them with point cloud and total station points. This has provided the best picture to date on the instrument installation specifications. The figure is drawn from my PhD thesis (in progress). TLS and CAD drawings merged to make an as-installed model of the AAD airborne instrument package.